The FIAT Lux ring is the official U of L Alumni ring. It is is an enduring symbol of your achievement and an unmistakeable emblem of pride! Introduced in the 45th Anniversary Year of the University of Lethbridge, the Fiat Lux Ring was designed by Eric Klempnauer. Cast in sterling silver, and only available for purchase to alumni, the Fiat Lux Ring embodies the memories, traditions and pride that tie U of L alumni together. The University's iconic emblem, the sun, is emblazoned on the band and is bordered by our motto, Fiat Lux - Let there be light. Each ring is individually engraved with a number in the inside of the ring that will be permanently assigned to the alumnus. Those who purchase a ring will also receive a special invitation to the annual Fiat Lux Ring Ceremony. The next ceremony will be held, tentatively, in May 2015. 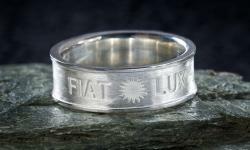 Fiat Lux Rings are sized using the North American sizing standard. You must know your ring size to order your Fiat Lux Ring. North American residents, please visit a jeweler to determine your ring size. As defined by the University of Lethbridge Alumni Association bylaws, persons will be eligible for the ring if they are a member of the Association. The members of the Association shall include all graduate, charter, associate and honorary members. Graduate Members - Any person who has graduated from the University. Charter Members - Any person who has graduated from any other university who shall have applied for membership in the Association on or before the first day of July, AD 1968. Associate Members - Any person who is not presently enrolled and who has completed 20 or more courses at the University, upon application to and approval by the Council. Honorary Members - Any person who has received an honorary degree from the University; Any person upon whom the Council confers honorary membership as a signal honor for unusual contributions to the welfare of the Association or University. Honorary Officers - The President of the University shall be Honorary President of the Association; The Vice President (Finance and Administration) of the University shall be Honorary Treasurer of the Association; The Chancellor of the University shall be an Honorary Director of the Association. Students wishing to purchase a ring must be in their final semester from completion of an official degree or a diploma offered by the University of Lethbridge. Permission to purchase a Fiat Lux Ring will be given to the current graduating class upon consultation with the Registrar’s Office. Permission to purchase a Fiat Lux Ring by another individual for an alumnus meeting the above criteria will be given by the Alumni Office. Correct sizing of ring will be the responsibility of the alumnus/student. Errors in sizing will not be eligible for a refund. Ring will not be delivered until completion of degree as determined by the Registrar’s Office. Additional engraving, such as degree information, etc., is the responsibility of the purchaser at his/her cost at the jeweler of his/her choice.